I feel like a broken record but I’m obsessed with Vince Camuto! 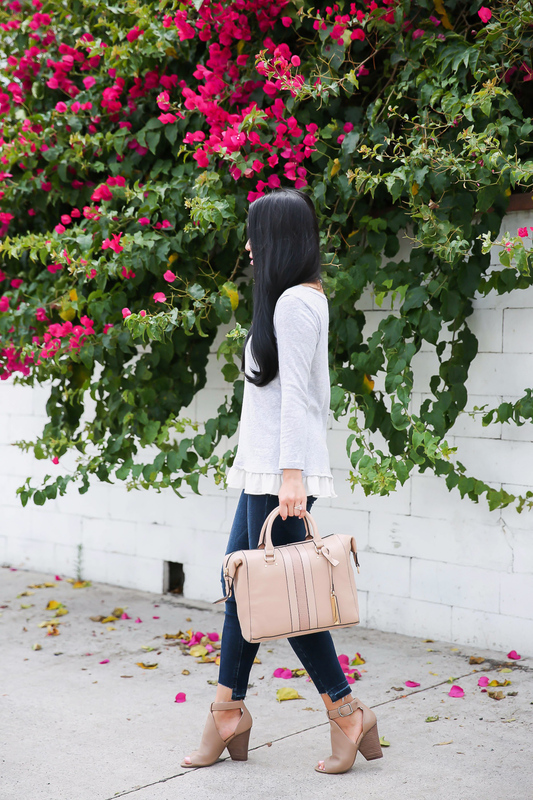 I’m super excited about these peep toe sandals and this lattice detail satchel. Both are so amazing and will transition beautifully into fall. First, you should know something. I’m extremely picky about my handbags and don’t buy very many. They have to be high quality and the perfect size. I actually use my handbags so it’s important to me that they will last more than a few months. I’m in love with this Mio lattice detail satchel. It’s just the right size and not overwhelming for a petite frame. Measurements are: 11.25″ W x 9.5″ H x 4.25″ D. There’s plenty of room for all your essentials and then some. I adore the shape and I’m still getting over how incredible the leather is. It’s buttery soft and supple – seriously amazing. It also comes with an adjustable and detachable strap that you can wear as a crossbody or on your shoulder. If you prefer a darker color, it’s available in black HERE. Now let’s talk about these peep toe sandals. You’ve heard me say this a million times, my feet are VERY particular. I know instantly whether or not they will be happy in a pair of shoes even before I put them on. As soon as I opened up the box and felt the leather, I was like OMG. How is the leather THIS SOFT? I knew right away my feet were going to love these. When I actually tried them on and walked around, I was even more excited. I cannot express enough how comfortable and soft these sandals are. Get them and get them NOW. Sizing runs true to size and I’m wearing my normal size 5. They fit perfectly and the ankle strap helps keep your feet in place. I usually have issues with my feet slipping but these actually stay put. The heel height measures 3.75″. I walked for several hours and my feet were happy. No pinching in the toe area or sides and my pinky toe wasn’t smushed. Hooray! I can see these sandals paired with a cute dress for brunch with the girls or you can wear it with your favorite pair of ankle jeans and tee. The color is the perfect neutral that will pair with everything in your closet. Love and would highly recommend! I bought the Loft ruffle tee even before Annie posted it. I agree it is really cute, but when I washed to puposely shrink it wrinkled so badly that no amount of Rowenta steam ironing could smooth it. LOL They are so comfy too! The bag is out of stock…I am 5,3”..110…you have great ideas …but slot of things are out of stock? oh no! things sell out really fast once my post goes live 🙁 Do you follow me on social media? I sometimes post items on Instagram before my blog…that might help too!